FREE UK DELIVERY ON ALL ORDER OVER £45 (£2.95 DELIVERY FOR ORDERS UNDER £45 NO MATTER HOW MANY ITEMS ORDERED). HAND MADE BY OUR FULLY QUALIFIED FLORIST. GREY, BABY PINK & IVORY ROSES. MATCHING BRIDESMAIDS POSIES, BUTTONHOLES AND TABLE ARRANGEMENTS ALSO AVAILABLE. MORE COLOURS AND DESIGNS COMING SOON. 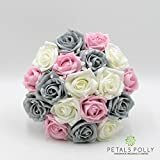 Petals Polly Flowers – Made to Order Professional Wedding Flowers – BRIDESMAIDS POSY – Grey, baby pink and ivory bridesmaids posy, made using a selection of roses. Professionally made from individual flowers, wired and finished with ribboned handle and bow. Flowers: Grey roses, baby pink and ivory roses. Posy diameter: 7″/18cm. Visit our shop for alternative designs and colours with matching table arrangements, flower girl accessories, buttonholes and corsages available: If you cannot see the design, colours or quantities you require just ask, we can supply your perfect flowers. Please enquire about our “individual” service. If you have any concerns regarding your purchase, please contact us before leaving feedback.